Shaped and styled just how the master preferred. 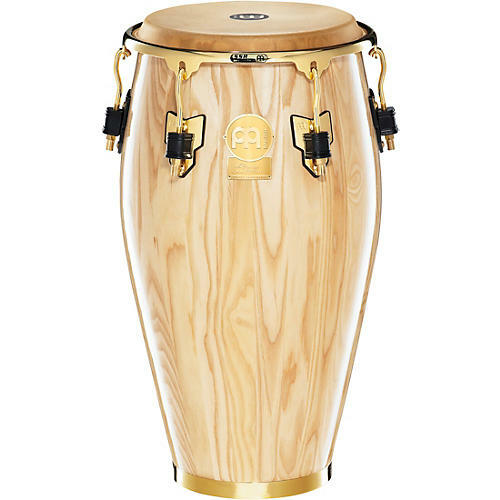 The Meinl Artist Series Mongo Santamaria Congas were made to Mongo's personal specifications. Their shape and style are just what Mongo wanted. The drum shells are made from 2-ply American White Ash finished in high-gloss. This construction is highly stable and very resonant. The heads are made of hand-selected True Skin buffalo hide secured with the comfortable SSR-Rim. The hardware is rugged steel and gold-tone plated for long lasting performance and appearance. The lugs are protected with the Meinl Conga Saver system. This system includes rubber grommets on the lugs to protect them when the drums are placed together. Ramon "Mongo" Santamaria was without a doubt one of the most respected conga players ever and a pioneer of modern Latin Jazz. During the 50's, his band Black Cuban Diamonds laid down the foundation for an outstanding career. He has recorded dozens of legendary percussion albums. Worldwide Jazz hits, such as "Watermelon Man" in 1963 and the album "Summertime" from 1980 are only two of the many recordings from this great master percussionist. Mongo has inspired more percussionists around the globe than any other conguero. Mongo Santamaria died at the Baptist Hospital in Miami, USA in February 2003. He was 85 years old. It is with great appreciation and deepest respect that Meinl honor his life's work with his Artist Series Mongo Santamaria Conga Drums.